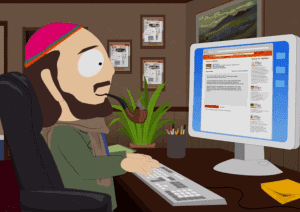 South Park Takedown of Yelp! EXTOR’TION, n. The act of extorting; the act or practice of wresting any thing from a person by force, duress, menaces, authority, or by any undue exercise of power. 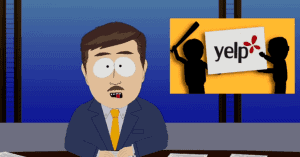 Kudos to Comedy Central’s South Park for their hysterical satire of the so-called review website Yelp! The episode aired on October 14, 2015 and immediately went viral. South Park exposed what so many American business owners have come to understand, that Yelpers are abusing the shoddy review board to extract unwarranted concessions from businesses. That’s called extortion or more commonly … blackmail. 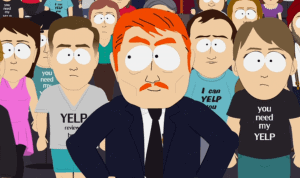 Ever careful of lawsuits, South Park only scratched the surface, concentrating on the Yelpers (reviewers) as opposed to the more ominous and unethical practice of Yelp! itself, which rigs their review process in an effort to extort advertising dollars from businesses. A class action lawsuit filed by businesses against Yelp resulted in a 3 judge panel calling the company’s methods, “hard bargaining”, but nevertheless technically legal. Nonsense. It is shocking to many that something so obviously unethical and ruinous to hard working American businesses could be in any way legal. If it’s not illegal, it should be. As Yelp’s true sinister motivations and lack of credibility in the market become more commonly understood, it is left to Wall Street to right the wrong. Yelp’s stock has lost nearly 80% of its value (as of October 2015) with more red ink looming. It is a business model doomed to failure precisely because it is dishonest. Yelp cannot hold onto their employees, many of whom do not dare list Yelp on their resumes, fearful of the negative association in Silicon Valley and beyond. 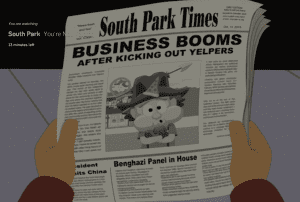 Satires such as South Park’s Yelp episode only add to the growing general perception that the anonymous Yelpers and the company itself are social pariahs. 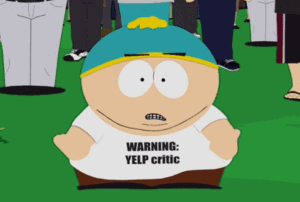 South Park makes fun of the self-important Yelpers who somehow believe that others depend upon their reviews, and clearly understands the power and influence they have over a business owner. 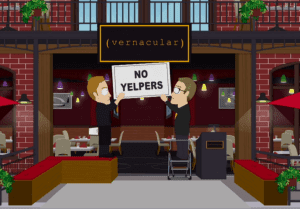 In the South Park episode, a Yelper doesn’t wait in line by announcing he is a Yelp critic. Another Yelper demands the lights be turned up, the music down and complimentary desserts in order for the restaurant to avoid a 1 star rating. Still another Yelper announces upon arrival that he is a Yelper and demands the best table … and so on. Eventually a restaurant owner is fed up, snaps, and tosses all the Yelpers out of his restaurant with a host of expletives. He says what so many business owners only wish they could. “Get the f… outta here!” Yelpers plot their retribution and “behead” the owner. South Park does a very good job of discrediting the anonymous and self important Yelper, which becomes a very deserved negative connotation. A Yelper might be a competitor and Yelp has no self interest in stopping the review and might benefit from the posting. Yelp has no way of discerning competitor reviews from customers. Everything is anonymous. Easy then for an established business to hold down or thwart any newcomers by posting sometimes very nasty comments about their competitor. The visitor is none the wiser. Indeed, the visitor is fooled by thinking the review is legitimate, and Yelp aids in the deceit by asserting that they can do what only God can do, know the identity of the writer. Yelp falsely asserts they have an algorithm that picks up “signals” that stop that sort of thing. Absolute rubbish. Even if it were possible, Yelp has no self interest in doing it and largely ignore requests from businesses that challenge a competitor review. A Yelper might be a Yelp salesperson who wants to push down a potential client’s rating score, only to remove the review if the business pays the $350 per month ($4,200 per year contract), and the salesperson earns his commission or quota. Yelp has no self interest in self policing the review, and actually might benefit from the posting. Yelp has no way of discerning an employee review from the customer review. Again anonymous. The turnover rate at Yelp! is enormous. It is a boiler room. Produce or get fired. Few employees last more than a year. The pressure on Yelp employees to possibly act unethically is incredibly high. A Yelper might do as the South Park episode suggests, punish a business for not caving into an unreasonable demand. Yelp loves, loves, loves negative reviews. The more the better. They can show and count toward a ratings score just enough bad reviews to hold a business rating down, with a pool in reserve, and pressure the business into spending $4,200 per year to hopefully and miraculously reverse the rating. Where there’s smoke, there’s fire. Too many businesses have reported incidences of that sort of behavior. Yelp can place in the “not recommended” and not counted toward ratings section the higher reviews, found by clicking on a barely visible light grey link at the bottom of the page, and scrolling first past the pool of negative reviews (by design), which are needed there to further bury the positive. A visitor has to really work hard to find the positive reviews, and likely sift through a ton of crappy reviews to get to them, which is all by evil design. Adding insult to injury, Yelp! places paid competitor advertisements on the pages of non-advertisers. The only way to avert the intrusion is to also advertise by paying $4,200 per year. Then that business can also act as a parasite on a competitor’s page. In Yelps’ world, a business becomes either predator or prey. One or the other. Eat or get eaten. The whole system is designed to pressure a business into doing what many of them do not want to do and that is buy Yelp’s third rate, ineffective and generally lousy advertising. That’s called blackmail. Or extortion. The Mafia is famous for it. Now Yelp! is. Direct Express Auto Transport Won’t Cave! We are rated 5 stars on Transport Reviews (the industry standard), Trust Pilot, Google Plus + and BBB Reviews. Over 100,000 customers love us! You wouldn’t know that reading Yelp, which stands alone in the negative column because … we won’t pay them the extortion fee! And guess what? Our business is booming. We do not need Yelp! Thank you to all our customers who do not take seriously the Yelpers and Yelp!